Android Auto vs Apple CarPlay... fight! We knew Android Auto cars were coming in 2015, but Pioneer has revealed a few ways to get the in-car system without buying a new ride. Three new models offer Android Auto, the AVIC-F77DAB, AVIC-F70DAB and AVH-X8700BT. They start at £699.99 ($1059/1311AUD) and all feature large seven-inch screens. One clear element that separates the top-end model, the Pioneer AVIC-F77DAB, is that it uses a capacitive touchscreen while the others are resistive models. The capacitive head unit should feel more responsive. All three models also support CarPlay, Apple's alternative to Auto. But as it has been around for longer, its inclusion isn't quite as big a deal. Still, multiplatform households will appreciate the choice. Android Auto is the car extension of Android, hooking up with your Android phone to get you smart features like GPS navigation through your phone rather than a dedicated head unit. All three offer Bluetooth, for audio transmission and for handsfree calls. If you have the cash to upgrade to one of the higher-tier models, you also get a DAB radio, complete with a Time Shift function. That equates to pausing and rewinding whatever you're listening to. The privilege of the early adopter is price. None of these Pioneer head units are particularly cheap. 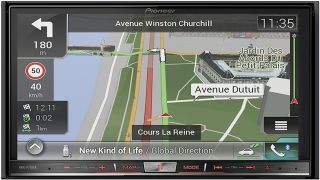 The Pioneer AVH-X8700BT costs £699.99 ($1059/1311AUD), the DAB-equipped AVIC-F70DAB is £999.99 ($1513/1874AUD) and the capacitive screen AVIC-F77DAB £1199.99 ($1815/2246AUD). All three units will be available before the end of Q1 2015.